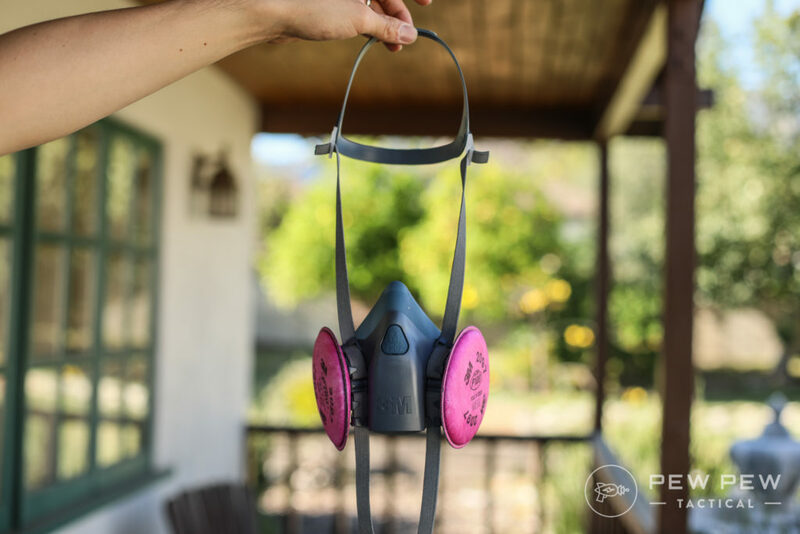 From wood dust to smoke…and even nuclear fallout…we’ve got you covered. 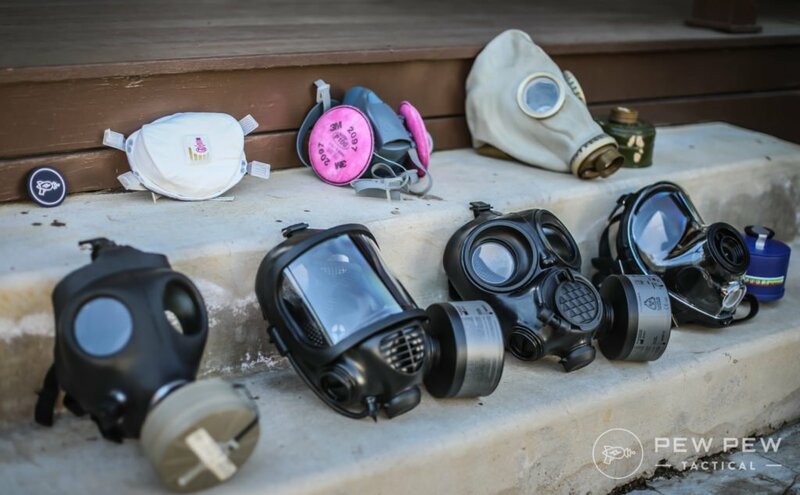 We’ve researched, asked experts, and hand-selected the best gas masks and respirators for a variety of safety and prepping scenarios. Then we tested them for fit, function, and value. And for the extreme ones… we even gassed ourselves and tested rifle shooting ability. So get ready for lots of pics and even some videos. By the end you’ll know the best protection for your purpose. 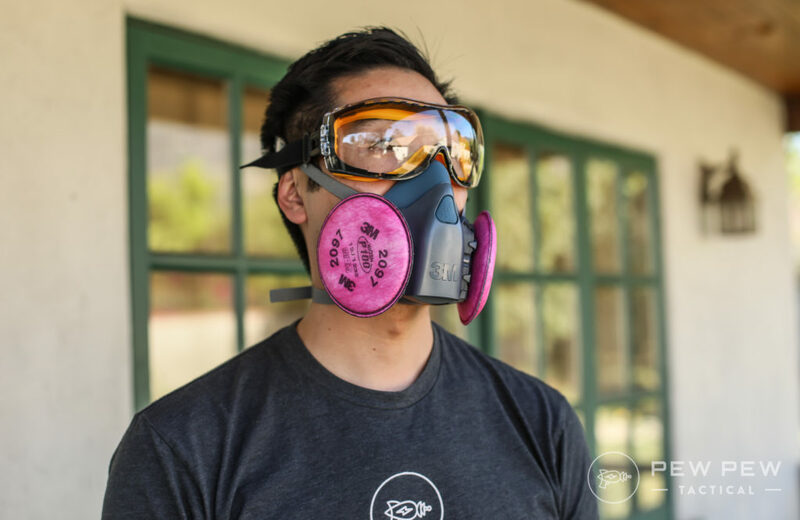 But…these are known as respirators and the 3M P100 above isn’t your regular dust mask or even surgical mask. There’s a TON of acrynoms and numbers in the respiratory protection game. If you’re getting something affordable and compact…get something with a P100 rating. 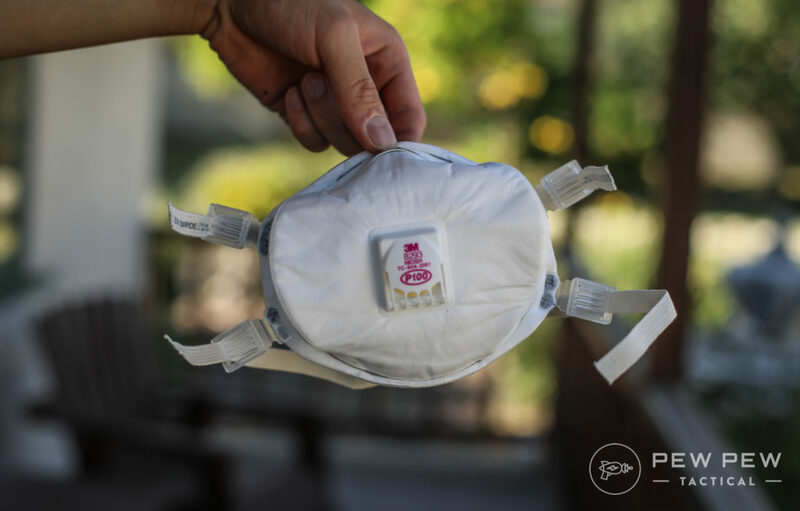 The more normal N95 is not oil resistant and only filters 95% of airborne particles. 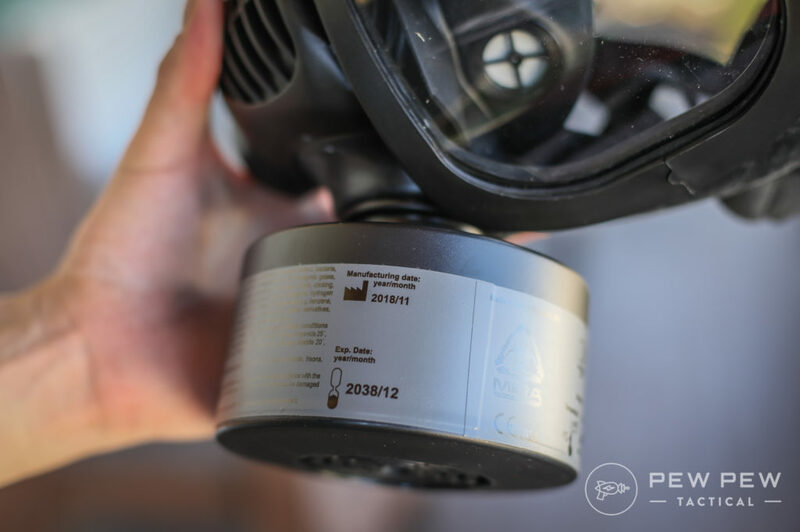 While the P100 is oil proof and filters at least 99.97% of airborne particles. 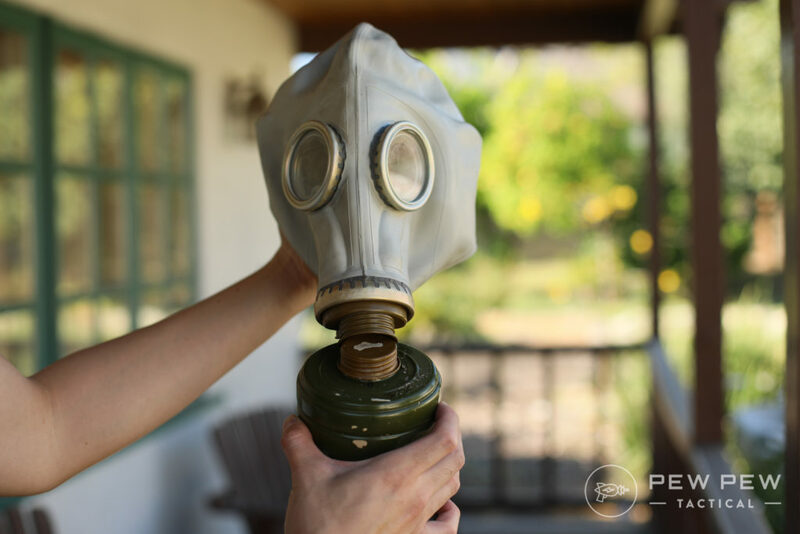 Sounds like not much of a difference…but can be a killer mistake if you’re exposed to asbestos from a collapsing building or bacteria/viruses in the air. 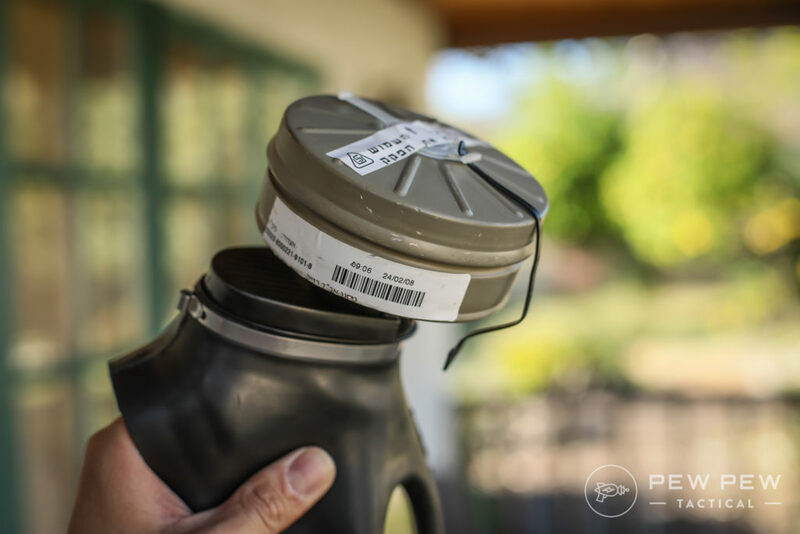 The 3M P100 filter is my basic pick since it’s affordable and also has an exhalation valve so it doesn’t get too stuffy after long use. Easy to keep in your bug out bag or vehicle. Plus, I use them for minor wood-working and renovation touring. Boom…let’s amp it up a little. 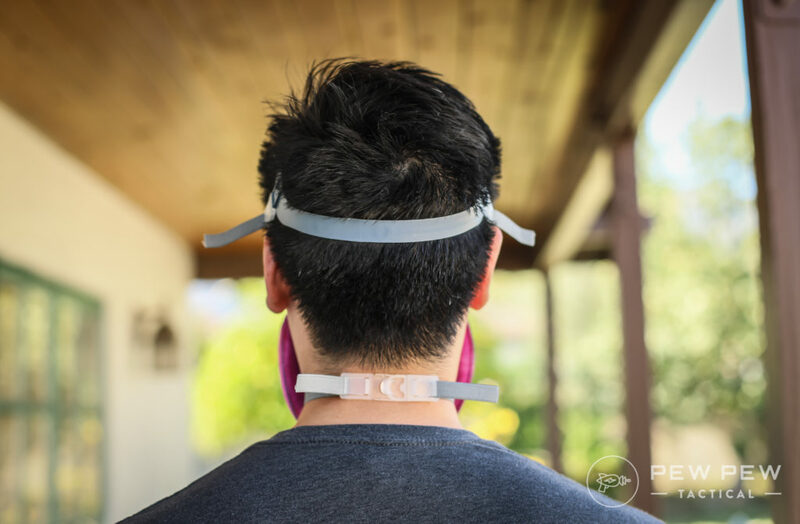 The half face respirator is great for better protection of your nose and mouth since it creates a nice seal. However, they are sized and I’m wearing a medium. The attachments are also pretty comfy and intuitive…and don’t require someone to help you put it on. 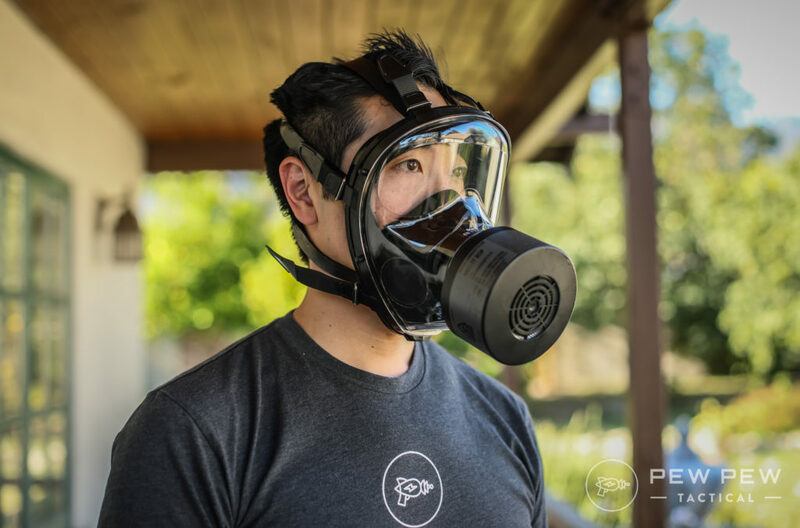 For filters…there’s the ones I’m wearing that are P100 plus Organic Vapor Relief. Which basically means it blocks some smelly stuff. There’s also other form factors such as the 7093B P100 filters which are encased in plastic so they protect from water and wetness. I’d recommend the 3M 7093 for prepping since you don’t know your situation. But the other ones are good for regular work when you know you won’t get wet. 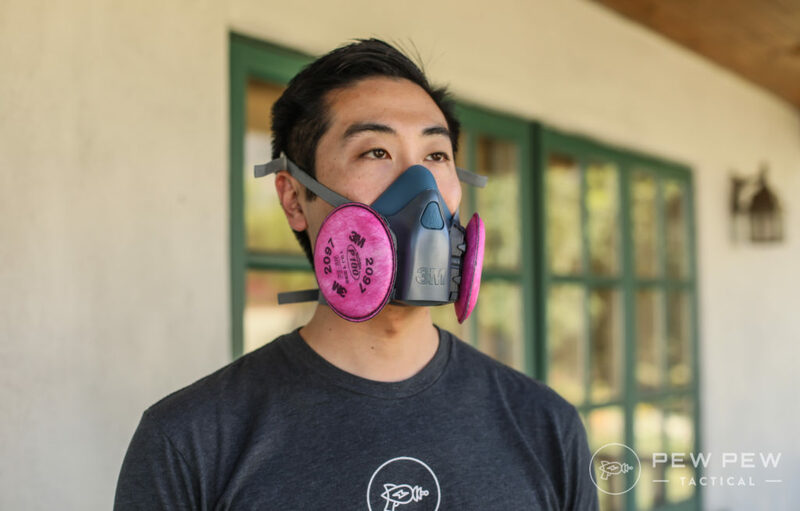 I have a big stash of the half face respirators to protect against big wildfires and disease outbreaks. That why I combo it with some simple goggles that give me a nice seal. And also some ear plugs. If you’re a shooter those foamy things are all you need. But we also have a guide for the Best Electronic Ear Protection too. Ok…this is an example of what NOT to get. Unless you’re doing some kind of cosplay…just don’t. 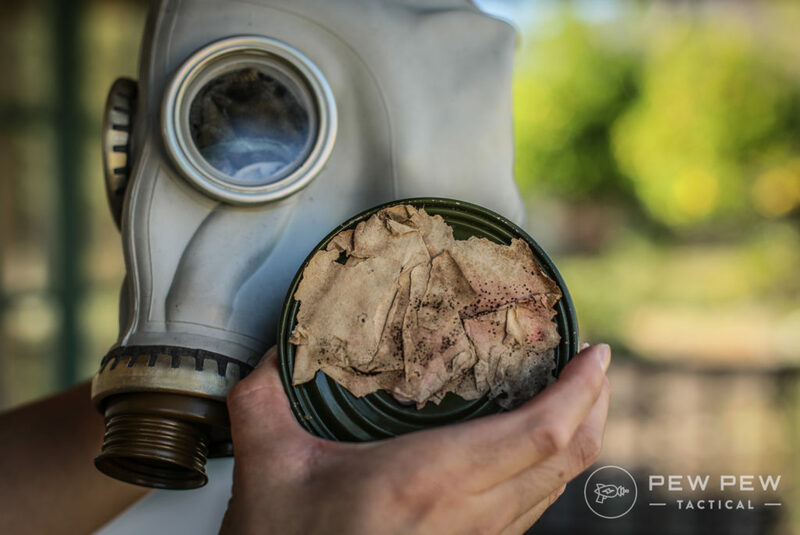 Russian surplus gas masks use a different filter threading so you probably can’t use new Western filters. They also can contain asbestos. And are usually liquidated once they expire. You never know how they were stored…etc. Russian Gas Mask Filter Bottom, Yum! I put it on without the filter and it definitely was super uncomfortable and claustrophobic. I had to take out my contacts and clean them since something in the mask got in my eye. So even if you are buying for fun…make sure to clean it out. Comes with a nice fabric bag though! Now we’re getting into real “gas mask” territory. 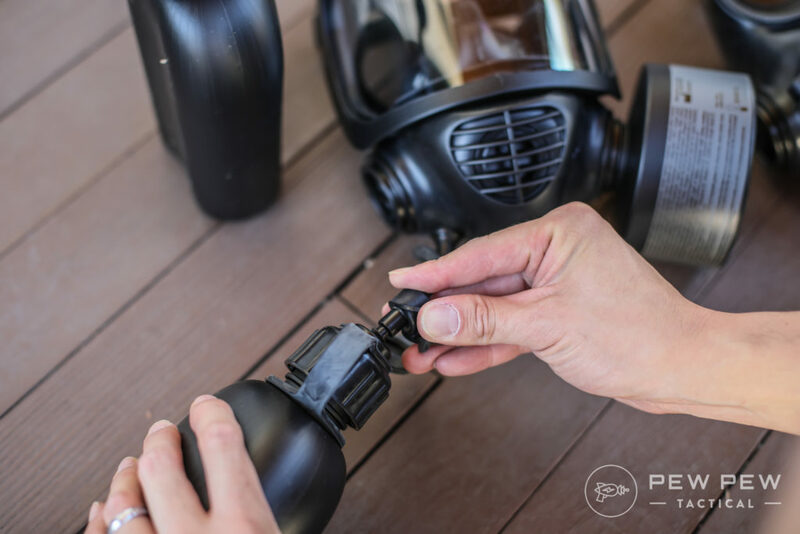 These Israeli gas masks are popular with the prepping crowd since they are still affordable. They sometimes come with a fresh-ish filter (this one is expired at 2008). And can take regular Western 40mm ones. And surprisingly…decently comfortable despite the appearance. However, I did experience some fogging after a few minutes. Visibility is also not bad with the two eye holes. 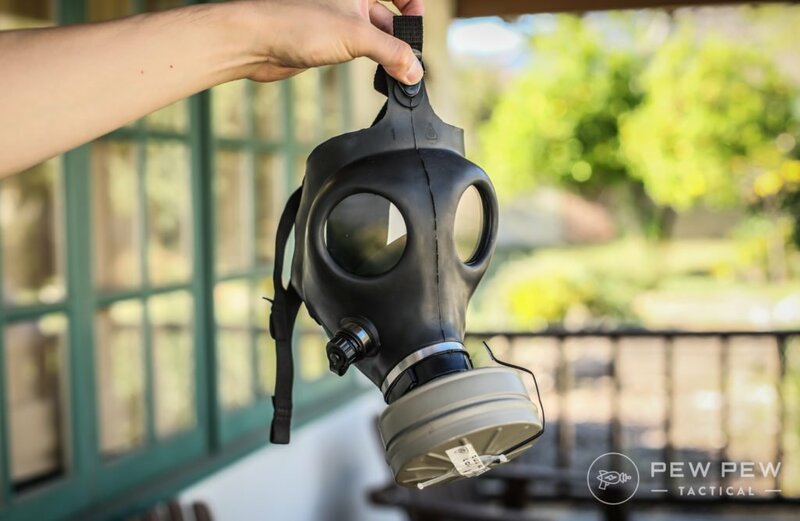 My recommendation if you want to go super budget with a full faced gas mask. 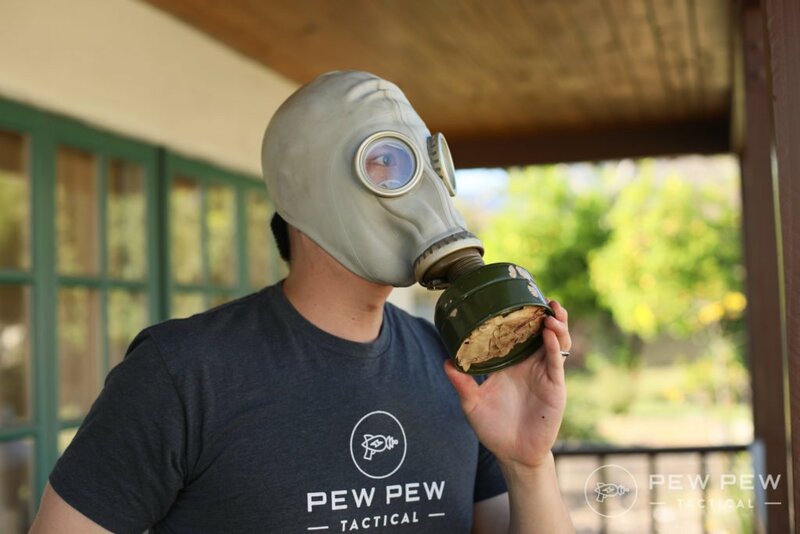 Make sure to pick up some new gas mask filters while you’re at it though. I’ll cover those combined with the next pick! This is my primary pick for most potential users. 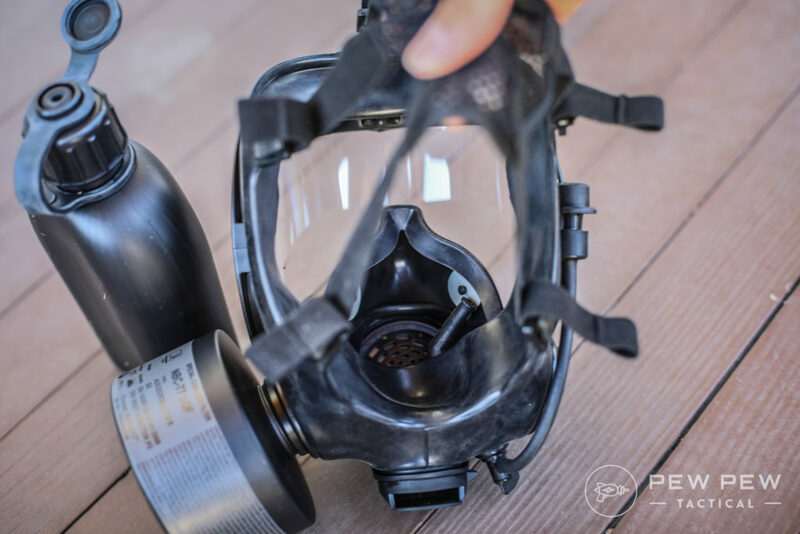 The Mestel SGE 150 gas mask gives you NBC protection and the ability to use regular 40mm filters. 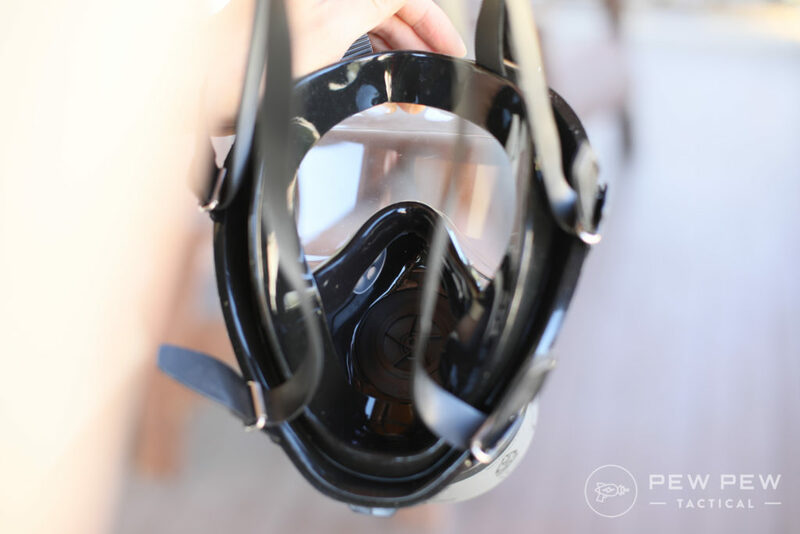 Mestel is an Italian company of diving masks so it’s essentially a modified mask to fit NATO filters. It has a huge field of view and is pretty comfy! No fogging up. Guessing their background has some advantages. Check out the inside…simple but to the point. 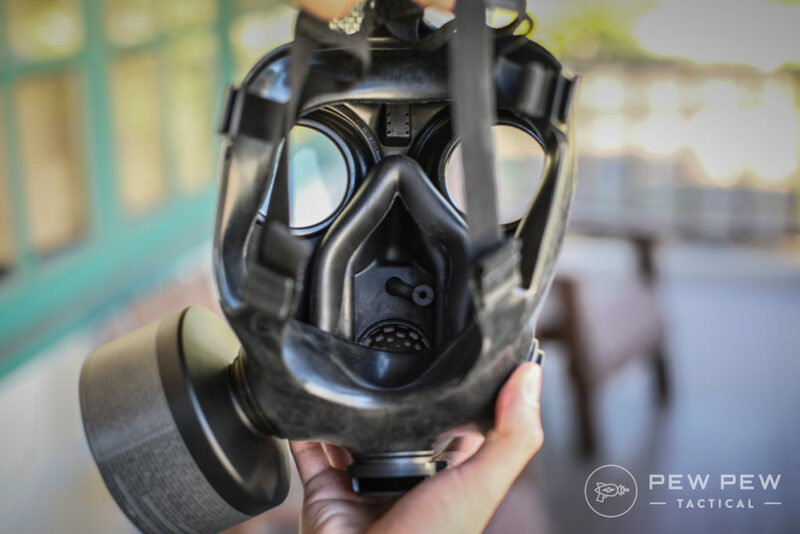 As for gas mask filters…I like the Mestel version for general preparedness. These are made for NATO, are NBC rated, and last up to 5 years. 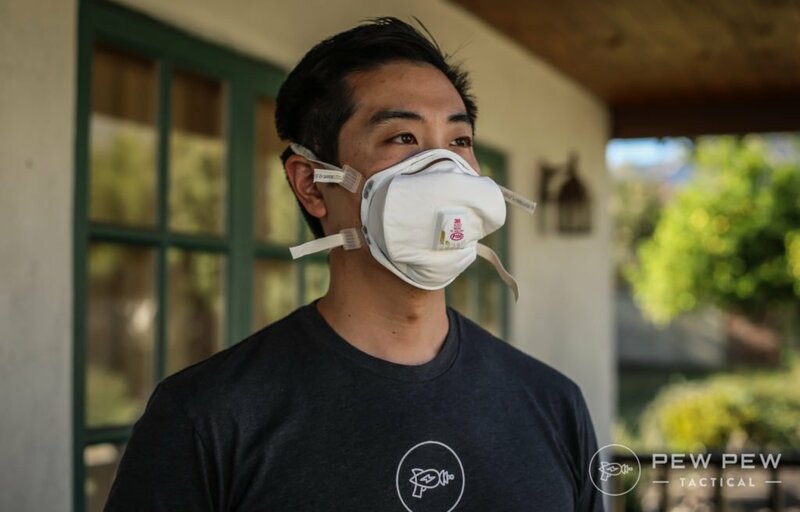 It’s possible to go through 1-3 filters a day…so prep accordingly! Those combo-ed with the Mestel SGE 150 are my favorite general prepping gas mask. What’s your take on the Mestel? Now…ready to go down the rabbit hole? 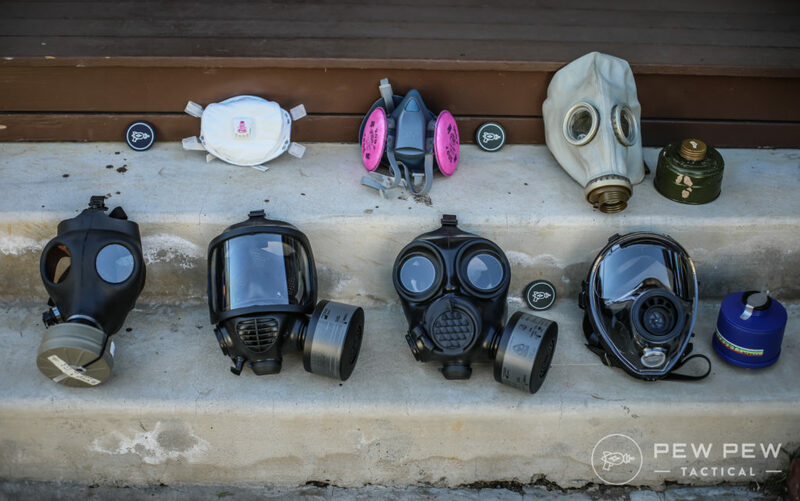 MIRA makes gas masks, safety equipment, and tactical gear in Texas…used by the US DoD and plenty of other countries. Kind of looks the same as the Mestel right? The CM-6M is rated for CBRN which is NBC with a little extra Radiation protection snuck in. 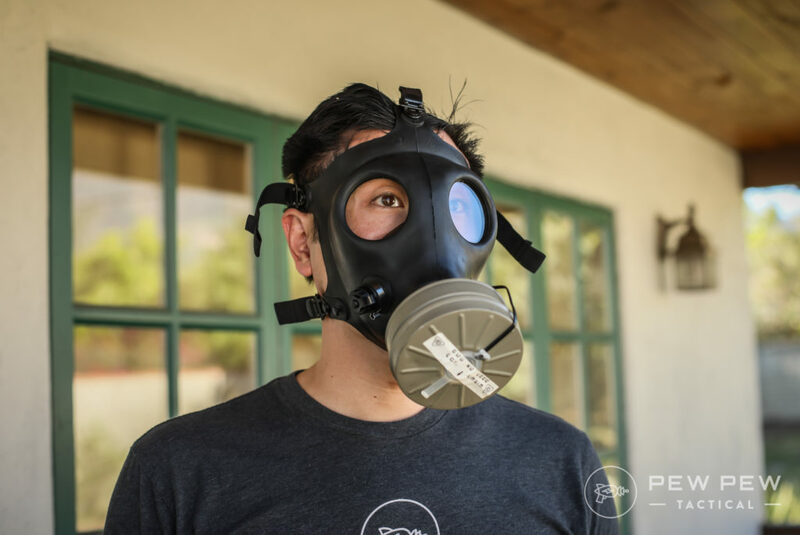 Yes…NBC masks can protect against traditional nuclear fallout from nukes. But now the extra “R” protects against dirty bomb isotope fallout. 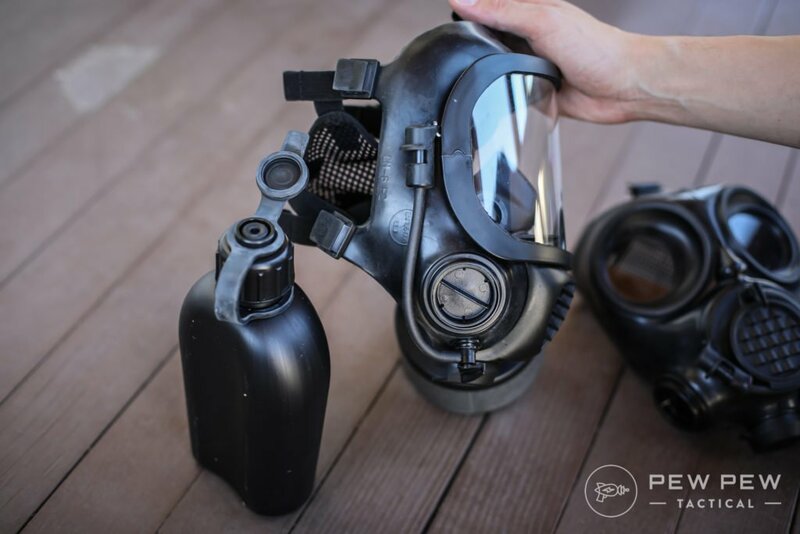 It does that with different materials…in this case…butyl rubber which is much more resistant to fallout, chemical warefare agents, and toxic industrial chemicals. It’s also very comfy and you get the choice of attaching the filter on either side depending on your rifle hand dominance. However, the CM-6M was more designed for a full field of view rather than rifle shooting. I found I had to tilt my rifle a little to get a good view through my optic. With un-magnified optics it will be a little easier. Plus you might get thirsty right…but can’t remove your mask? The mask comes with a drinking straw! Which attaches nicely to the canteen. As for filters…you can run the Mestels. Or better yet…check out MIRA’s very own. They can be stored for up to 20 years instead of 5 years. Which probably turns out to be a better deal if you aren’t likely to use them. As for the CM-6M…they might be the best choice for you if you value extreme protection from almost everything out there…and want a comfy large field of view. Need something made for shooting? The CM-7M might fit the bill. Also ambidextrous in filter attachment. The main change that makes shooting easier is the depression at the cheek. Unfortunately it means you have to switch to the bug-eye design…but field of view was still very adequate. It also comes with the drinking straw attachment although in a different area. And for these…I’d recommend sticking with the MIRA filters. Now…we wanted to do some sort of test. Amazingly, Amazon sells some Pepper Spray Grenades. Less grenade…and more upward spray. But the two MIRAs passed with flying colors. 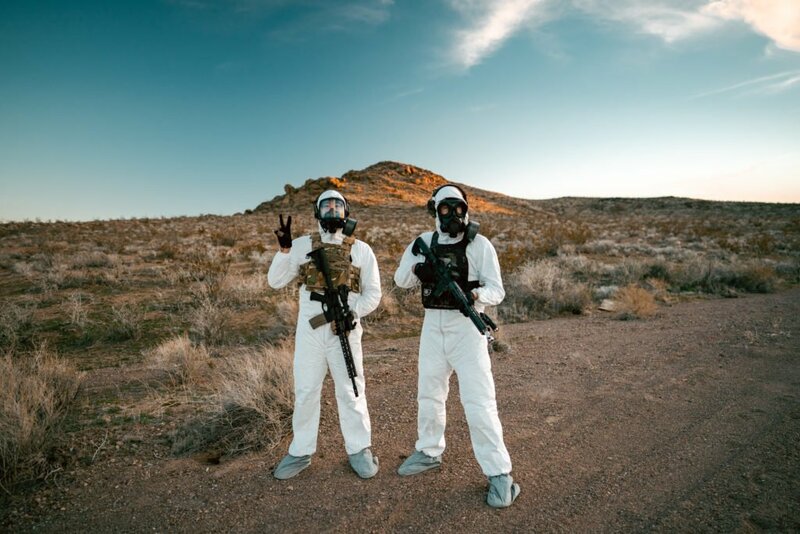 And yes…the pepper spray was in the air and got all over our Tyvek suits. I found out the hard way when I touched my eyes and lips afterwards. For when you need CBRN protection AND the ability to more easily shoot a rifle…check out the CM-7M. What About Beards & Kids? 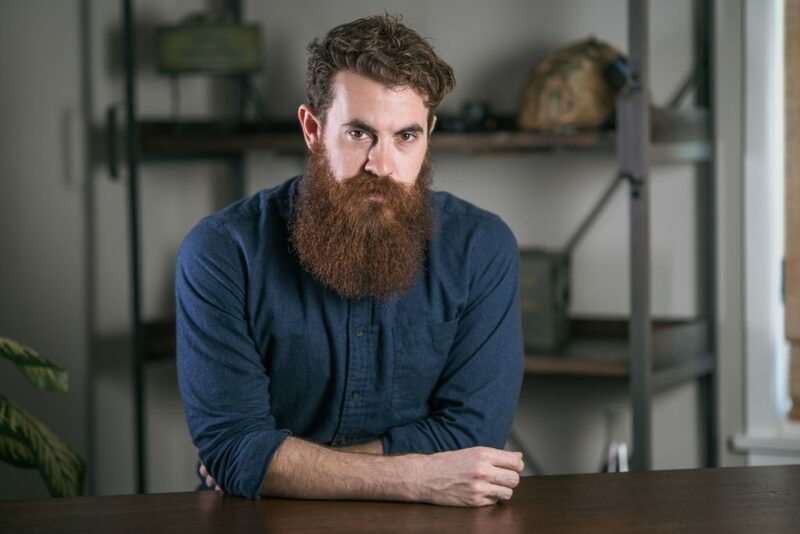 What if you have a beard? It’s just not going to have that airtight seal you want. John, our resident social media guy/beard man, wore the CM-7M in our pepper spray grenade test and came out unscathed. But that’s not the same as something more pervasive or harmful. Your best bet would to shave…or go with a hood. 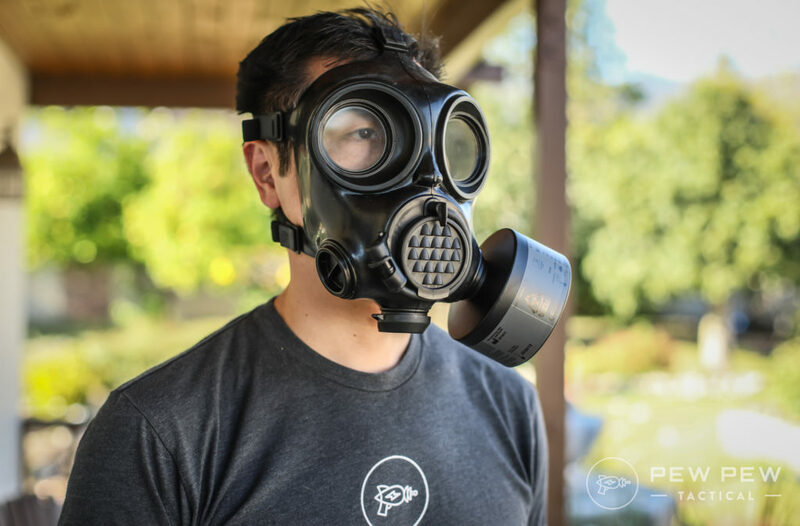 The above Firemask will fit children as young as 3. Otherwise there’s also a child version of the Mestel. 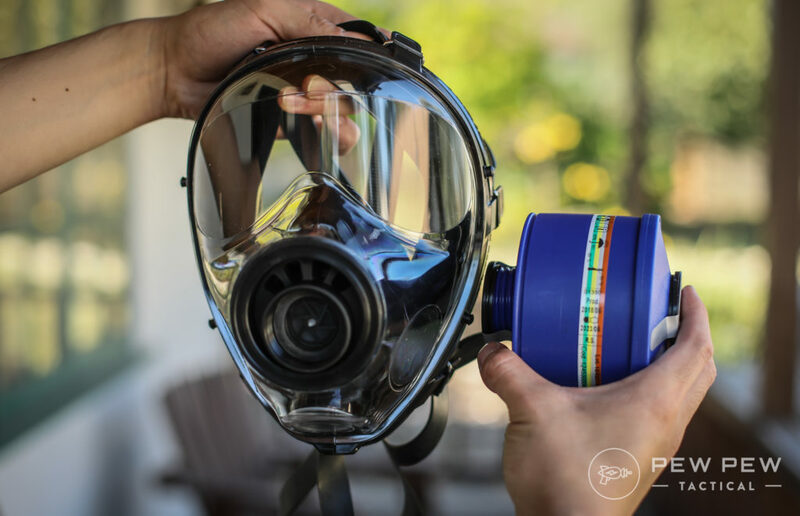 Hopefully this helped in you choosing the best respiratory protection for your intended use. 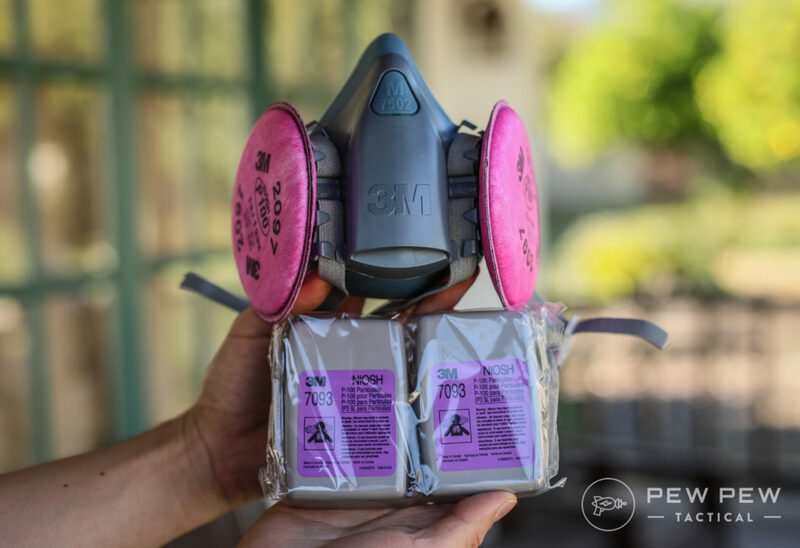 If you’re doing a general prep bag…or want to be 99.97% protected from general contaminants…get the 3M P100 Disposable Respirators. 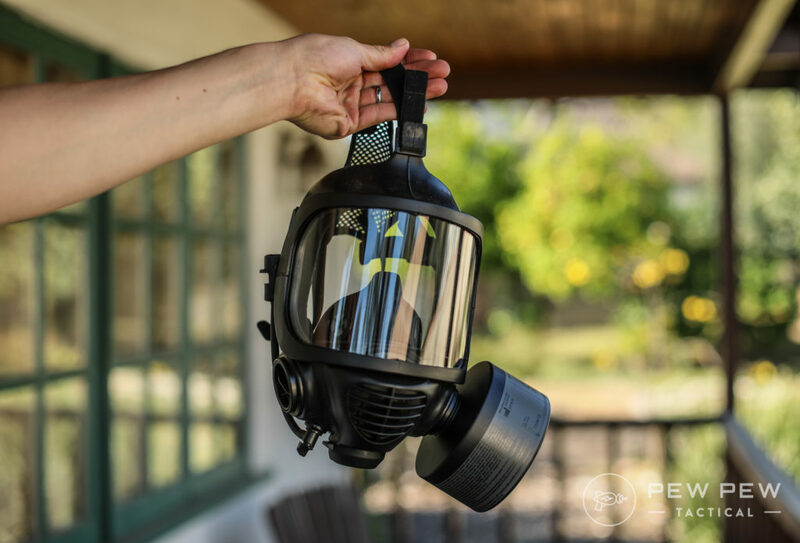 If you’d like a little more protection in a re-usable format…get the 3M Half Face Respirator. Combined with the 7093 P100 filters with smell reduction. But be sure to pop in a new filter! And if you need all the bells and whistles of protection (and shooting ability)…check out MIRA. Combo-ed with their 20-year shelf-life filter. 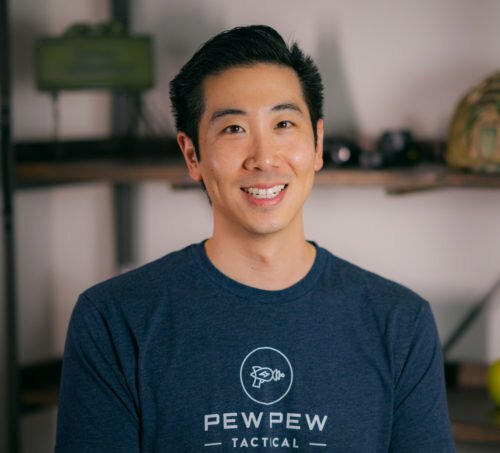 Need other prepping help? We have our Essential SHTF Gear List and Best Water Storage Methods & Containers. I bought a russian GP-7V out of poland a long time ago, and some new old stock nato NBC filters off of ebay. 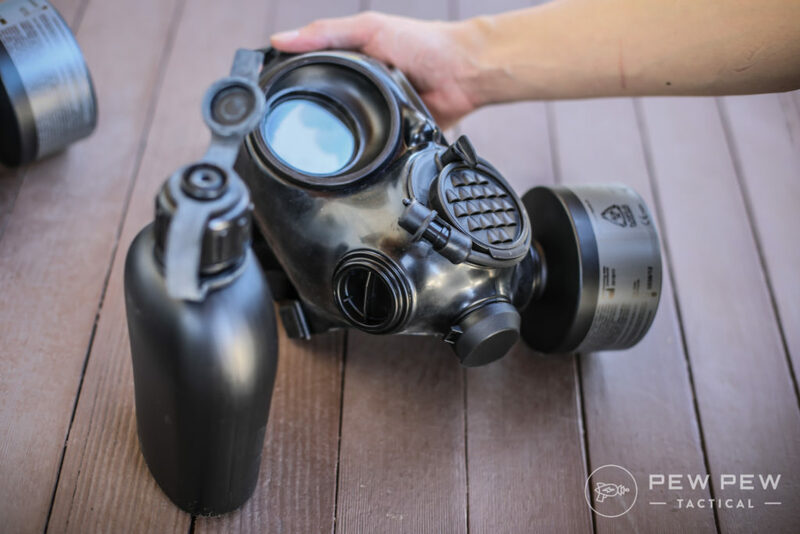 the GP-7V has the protection of your more expensive masks, drinking straw that fits nato NBC canteens, and shooting ability (because russians), but it DOES tend to fog a bit (because russians). Get out of here, S.T.A.L.K.E.R. What if you have a full ZZ top beard? YEA,,,What if you have a full ZZ top beard? It’s simple. If you really NEED the mask and you have a beard you die. The only alternative for protection with a beard is a full protective suit with forced air. Texas Smoke got it right! I added a section for bearded folks and children. You can shave it off…or go with hood-type protection.